Living room, Kitchen, 1 Bathroom, 1 Bedroom, Air Conditioning, Wifi! This wonderful apartment is located in Piazza di Pietra, one of the most beautiful squares of Rome. It is the ideal accommodation for families as well as for couples. If you want to stay in a cosy, well-organized apartment in the heart of the city, this is the ideal solution. Recently renovated and furnished with a touch of typical Roman elegance, this beautiful apartment is located on the 6nd floor (5 with elevator) of an ancient palace. The flat is composed in this way: a spacious and comfortable living room and dining area, a large bedroom with a double bed, a bathroom with shower and bidet; a very well organized kitchen. The apartment is equipped with an independent heating sistem and air condtioned. There is also a free internet WiFi connection. As the apartment is located at the last floor of an ancient building (attic) some areas cannot be used because of the height. Please be careful at the beams especially if you are tall. Inserted in a fairytale context, in one of the historical buildings of Rome, our apartment will guide you through a journey back to the past. Here the time has stopped: you will not need any imagination effort to feel part of a world that doesn’t exist anymore! Lovely (if a bit low-hanging) Stay in Rome! 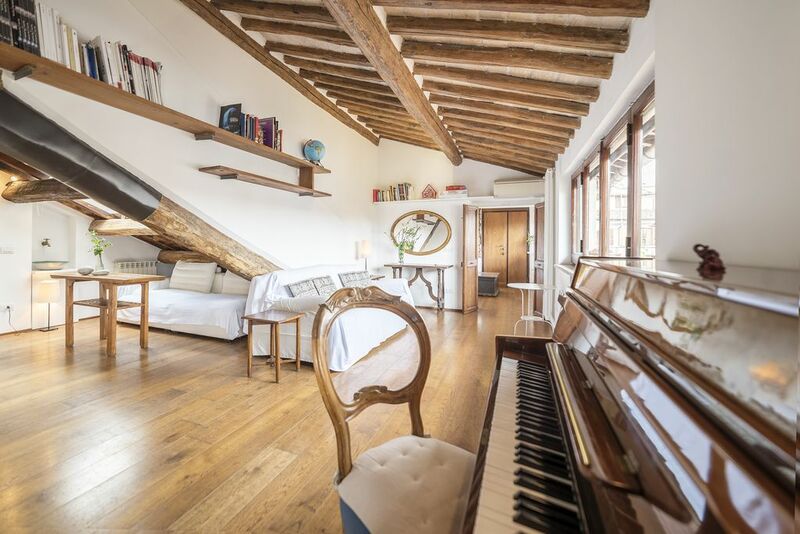 Spacious, well-appointed, funky/charming place located in Piazza Pietras, within quick walking distance of the Pantheon and Trevi Fountain. Marta was especially gracious and helpful with meeting us and orienting us to the property. Once you get used to the angle of the ceiling (and its attendant, aforementioned low-hanging beams), you relax and feel part of everything around you. Great restaurant steps away from the front door, too! Staying for three nights in the roof space apartment near the Pantheon. Quirky apartment, clean and great location. Walking distance to almost everything or just a quick trip on the metro. Lovely restaurants close by. Would definitely recommend. Quirky apartment in great central location. Great communication prior to arrival. Clean and well equipped. Lots of lovely restaurants within easy walking distance. Amazing Location with a modern feel but with all the history and charm of Rome! Location was amazing! Steps to Trevi Fountain, Parthenon, transportation and taxi's. Building opens up onto a beautiful little piazza with views of Hadrianus Temple, and a nightly show of the history of the temple. 180 degree views of Rome's skyline. Apartment is huge and very comfortable. All the comforts and privacy of home. Even though the apartment is in an attic and Rome was extremely hot at the time of the visit, the air conditioning in the apartment kept us cool. and provided an amazing retreat each time we returned from our adventure in the city. Would definitely stay again and recommend to others. You have to experience it! Très bel appartement en plein coeur du centre historique de Rome. Bonne communication lors de la réservation et après également. Il y a ce qu’il faut en équipement dans la cuisine. Our amazing apartment represents a key to answer some of these questions! Inserted in a fairytale context, in one of the historical buildings and Piazzas of Rome, our apartment will guide you through a journey back to the past. Here the time has stopped: you will not need any imagination effort to feel part of a world that doesn’t exist anymore! You will have the opportunity to lodge in a very exclusive Roman style apartment with 1 bedroom, 1 bathroom, a nice kitchen, and large living room with a dining area! Pietra apartment will be the starting point of your journey through the past, the present and the future of the Ethernal City.